Well, after the disaster that was Brimstone. I wasn't really going to try any more whiskey. In the words of my friend Tom: "It's got an E, run!" He was probably right about the Brimstone, but I thought I'd give a Bourbon a chance. Nose: Classic Bourbon. Caramel, toffee, vanilla, herbal with mint. Taste: Intense with caramel and a herbal edge. Mint leaf. Good balance. Finish: Long length. Fresh mint. 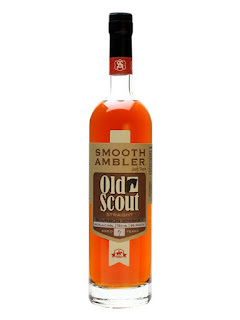 Notes: Good but I can never find a Bourbon with the same complexity as a Scotch. For contexts sake, I've never scored a Bourbon higher than 75 (UPDATE: 5 months later, I have now scored a Bourbon 80/100). But I haven't tried loads as it's pretty hard to find the good quality stuff in the UK.